Discussion in 'The Poker Talk Corner' started by Marina, Apr 23, 2015.
of his games, he was elected the winner by the other players, naming him the Best All-Around Player. During its humble beginnings there wasn’t much demand for poker. There weren’t even 50 poker tables in all of Las Vegas. Even the hosting casino, the Horseshoe, didn’t have a poker room. And in that first game only around 30 gamblers showed up. on The Tonight Show Starring Johnny Carson eleven times, bringing quite a bit of credibility to the game as he was broadcast to homes all over America. 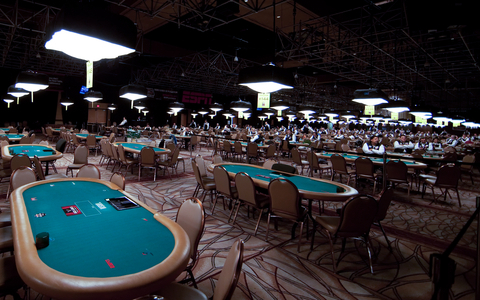 rounds including razz, seven-card stud, no limit hold’em, and deuce-to-seven draw. to maybe get a taste of the big time. The event had officially captured America’s imagination. to further expansion, and by 1987 the game had to expand to three casinos, which included the Golden Nugget, Horseshoe, and Four Queens, to accommodate its 2,100 entrants. (not a nickname) came in and overcame the odds for the WSOP by being the first player to ever qualify online, opening the door for even more amateur play and significantly more interest in the tournament. It helped that he won it all live on ESPN. Champions, an invite-only freeroll tournament in which Annie Duke took the $2 million top prize. as well as one of the few women to make it to a WSOP Main Event. Annette Obrestad took home an early birthday present the day before her 19th birthday. By 2013 the WSOP began Series events in Gauteng, South Africa and at the Crown Melbourne in Australia, attracting even more international attention and gaining more international players. home the most prestigious award in all of poker—the WSOP bracelet. Very nice information! I really like Poker but not a good player lol.